It would be nice to think that Bradfordians also felt uncomfortable with his venomous anti-Zionist rhetoric (he declared Bradford an Israel-free zone) and were concerned for Bradford’s small Jewish population. Meanwhile, Labour lost 24 seats from last time! Much of Labour’s Parliamentary party is still anti-Israel and Labour’s main anti-Israel firebrands survived, including the likes of Gerald Kaufman, Andy Slaughter and Richard Burden who has met with Hamas. Labour also added Rupa Huq to their anti-Israel numbers. 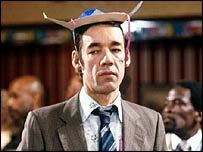 Trigger from Only Fools and Horses says “Don’t attack Iran”. Roger Lloyd Pack - "intellect has rapidly diminished over the years until it reached its current level of hilarious stupidity"
It’s a shame when an actor from one of Britain’s best loved comedies joins with the forces of darkness to come to the defence of one of the world’s most reviled regimes, but such is the fate of Roger Lloyd Pack who played Trigger in the BBC’s Only Fools and Horses. Lloyd Pack is a seasoned anti-Israel activist and so it is no surprise to find his signature among the usual suspects in a letter to Wednesday’s Guardian supporting Stop The War Coalition’s Don’t Attack Iran Campaign. Who said art doesn’t sometimes mirror life? The Guardian website even generously links the letter to the Don’t Attack Iran Campaign website. Why take out an expensive ad in a national newspaper, hire an expensive London venue or print millions of leaflets when all you need do nowadays is write a letter to The Guardian who will give you free advertising space if you’re anti-Israel. You’d have thought that after her forced resignation from her party after wishing away Israel’s existence they might have left Jenny Tonge off for once but, then again, her recent statements that “Israel is not going to be there forever” and “then they will reap what they have sown” ties in nicely with Ahmadinejad’s genocidal desire to wipe Israel off the map. Some say Ahmadinejad was mistranslated and that he merely wanted to eradicate Zionism. Let’s forget that Israel and Zionism are not mutually exclusive and gloss over Ahmadinejad’s “mistranslation” and listen to Iran’s Supreme Leader Ayatollah Khamenei who, as reported by Press TV, “described Israel as a cancerous tumor that must be removed”. It doesn’t get more unambiguous than that and straight from the fool’s and horse’s mouth! And calling it an attack on Iran is like calling Operation Cast Lead an attack on Gaza or on the Palestinians when, in actual fact, it was a legitimate attack on the terrorist group Hamas in self-defence. Attacking Iran’s nuclear sites will also be a legitimate act of self-defence unless Iran opens itself up to a full nuclear inspection in accordance with its non-proliferation treaty obligations, something that it has so far proved suspiciously unwilling to do. And calling itself Stop The War Coalition is as equally disingenuous. Let Them Die Coalition would be far more accurate judging by their calls for non-intervention in Libya and, now, Syria. The Guardian letter compares the build up to a possible war with Iran to that with Iraq. But Stop The War Coalition’s approach is itself reminiscent of Neville Chamberlain’s appeasement of another evil regime. Galloway and German say they aren’t pacifists and Galloway has said that World War Two was a just war, but how can he, and we, be so sure he would have called it “just” at the time. Stop The War Coalition is, basically, an organisation that supports non-intervention against regimes that are anti-American and/or anti-Israel. They were ecstatic when pro-American/pro-Israel Mubarak fell in Egypt but have criticised NATO’s ousting of anti-American/anti-Israel Gaddafi and will no way want Assad to fall with the negative impact that would have on Iran and, ultimately, Hezbollah and Hamas. The hypocrisy of the signatories to The Guardian letter is fully exposed when Stop The War Coalition feels comfortable standing back watching Libyans and Syrians slaughtered in their droves while defending the vile Iranian regime and staying silent about the continued oppression of Iran’s women, gays, Jews (the 25,000 strong community is limited to one MP), Bahais, Kurds and anyone wanting to live a life in Iran as free as those signatories themselves can do in the west. Muslim Brotherhood’s Dr Kamal El-Helbawy defines who is a Jew, and who isn’t. 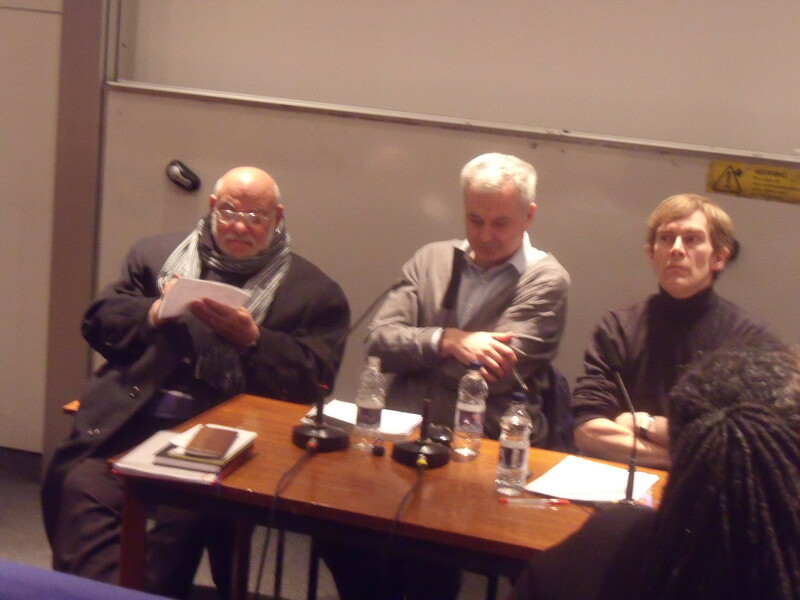 Dr Kamal El-Helbawy, Andrew Murray, Seumas Milne at the SOAS Respect meeting. When I went to SOAS on Sunday for the Respect Party’s public meeting Where now for Egypt and the Middle East?, chaired by The Guardian’s Seumas Milne, I didn’t expect a sermon on who is, and who is not, a Jew. Dr Kamal El-Helbawy, Chair of the Centre for the Study of Terrorism and former speaker for the Muslim Brotherhood in the West, was updating us on the political situation in Egypt as he saw it. He welcomed the fact that 75% of the new Egyptian parliament was now Islamic, but said that he hoped for increased Coptic Christian participation and the promotion of women. The Muslim Brotherhood isn’t especially keen on Jews. For example, Hamas, the Brotherhood’s subsidiary in Gaza, remembers us in their Charter by calling for us to be killed. However, Dr Kamal El-Helbawy seemed to be concentrating on Egypt’s pressing internal issues. Could this be a new Egypt; a Light Unto the Arab nations, I thought? Fifteen minutes into his speech and Dr Kamal El-Helbawy still hadn’t mentioned Israel and the Palestinians. Amid all this fascination with Jews Galloway, Kate Hudson, General Secretary of CND, and Andrew Murray, founder of the Stop The War Coalition, rejected all types of outside intervention in the affairs of Syria instead calling for the revolution to be allowed to take place from the ground upwards on the basis that there had never been an example of outside intervention working effectively in the Middle East and that such intervention always took place out of pure self-interest. George Galloway: “Iran ready to fight to the last drop of blood”. 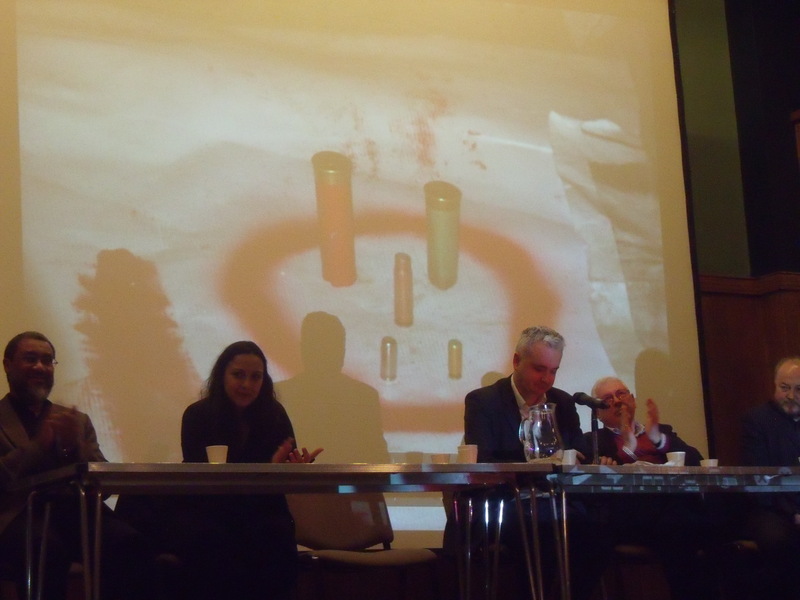 Shirin Shafaie, Chris Nineham, Tony Benn, Lindsey German, Abbas Edalat prepare to spout nonsense. George Galloway gave warning that should Iran be attacked by Israel then “the Persian Gulf will be on fire, the Straights of Hormuz will be on fire and the allies of America in the Gulf will be on fire” and Iran will also answer “inside Iraq”. And he said that Iran is ready to fight to the last drop of blood. Galloway was the final act in Monday night’s Don’t Attack Iran meeting in London organised by The Stop The War Coalition, a coalition that is against any war (unless it’s against Israel, of course), even the war in Libya which would have left possibly thousands to be massacred in Benghazi by Gaddafi’s forces had NATO not intervened. Well, that wasn’t the case in Libya was it! NATO’s attacks on Gaddafi’s troops strengthened the opposition leading to Gaddafi’s downfall. And, likewise, I am sure that the good people of Iran would welcome an attack on their own cruel regime that still stones women to death and hangs gays for being gay. Johnson should stick to dealing with matters to do with London as he obviously hasn’t a clue about foreign affairs. Benn disappeared early after the usual announcement that he had to be up early to give yet another talk, although it was more likely the lure of a hot cup of cocoa and a pair of warm slippers that sent him on his way. Other speakers told us how cuddly and peaceful today’s Iran, basically, is. It had never attacked anyone, don’t you know! Abbas Edalat, a professor in Computer Science at Imperial College, thought the war against Iran had started in 1979 after the Revolution, while Shirin Shafaie, a researcher at SOAS, claimed it started as far back as 1953 with the overthrow of Mossadeq. Edalat claimed there was even a self-imposed fatwa against Iran possessing nuclear weapons and weapons of mass destruction and that the aim of the West was to recolonise Iran like it did in 1953. These people honestly believe the rubbish that pours out of their mouths. It is a remarkable sociological study to hear such delusion and to see how an audience, albeit a small one, laps up this rhetoric. Oh, and just in case there wasn’t enough instability in the Middle East I was passed a leaflet detailing how Palestinians living inside Israel and those from the West Bank and Gaza are due to be joined by Palestinians and others from Egypt, Syria, Lebanon and Jordan for a Global March to Jerusalem arriving in Jerusalem on “Land Day” (30th March 2012 to you and me). For an organisation that claims to want to stop war The Stop The War Coalition tries its damned hardest to encourage as much bloodshed in the Middle East as it possibly can. The Egyptian Revolution comes to Holborn. John Reece shows off his photos of his trip to revolutionary Cairo. Just before last night’s Stop the War Coalition’s meeting in London in support of the Egyptian Revolution began I turned to Jonathan Hoffman and asked him how long he thought it would it take before they mentioned Israel. “Immediately”, was his grim response. And he wasn’t wrong. The first speaker up was Bernard Regan of the Palestine Solidarity Campaign (see clip below). Lowkey, a rapper best known for his tune Free Palestine, couldn’t help himself either, ending his speech with the cry, “The path to the liberation of Jerusalem runs through Cairo”. The finale was left to George Galloway who described Mubarak as a “murderer, torturer and dictator” who would “be lucky to avoid being strung up from the street lamps”. Two Egyptian activists were eventually allowed to speak. Their cause wasn’t totally hijacked (no pun intended) and they didn’t mention Israel once. They just wanted to be free. 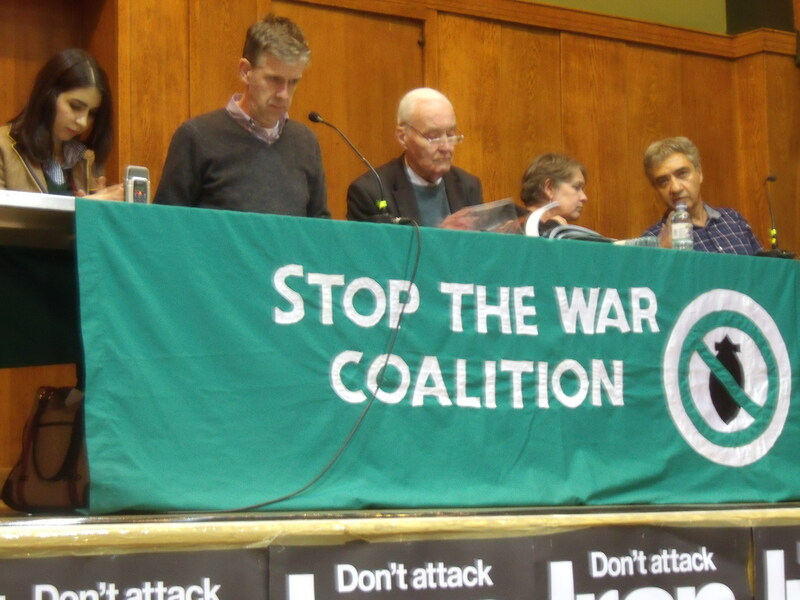 We also heard from two Stop the War Coalition activists who, while 30,000 Brits. are trying to leave Egypt, actually flew in to Cairo for the weekend especially! John Reece showed us his photos (see background above) and informed us of the massive under-reporting in the British media of the people on the streets of Egypt. Although, Reece said, the Egyptian army reported one million in Cairo every one he knows spoke of two million. He estimates that the figure was somewhere between four and eight million for Egypt as a whole. Egyptians should heed George’s words and put all notions of freedom to the back of their minds for now just in case the Muslim Brothers are, indeed, eventually successful. A bad year for Israel in the UK has also been a bad year for many of those who have briefed so viciously against Israel. Nick Clegg, who called for Israel to be disarmed during Operation Cast Lead in the wake of thousands of Hamas rockets hitting Israeli towns, became Deputy Prime-Minister in the coalition government but has since had his new found credibility shattered having reneged on a pre-election promise that had won his party the student vote; not to increase tuition fees. Clegg and his anti-Israel Liberal Democrat party will find it difficult to be taken seriously in future, including on Israel. Lauren Booth seems to have hit financial rock bottom with her bankruptcy and George Galloway lost his national radio slot on Talksport and was ousted from Parliament at the General Election along with Martin Linton, Chair of Labour Friends of Palestine. Woe betide those who fall from power. The pro-Arab Lobby will have no use for them and will end up looking elsewhere. So one man’s loss is another’s gain and the new anti-Israel voice on the block is Andrew Slaughter, who retained his seat in the election. Although Slaughter is Labour’s Shadow Justice Minister that didn’t stop him recently meeting Hamas; the organisation that likes to send Palestinians into Israeli restaurants and discos primed with bombs to murder as many Jews as possible. It has been a year where the picket of Ahava in Covent Garden has taken root, with the objective of closing it down. In a way it has been a sad but fascinating experience to see the type of person that turns up to picket a Jewish owned shop. Less attention has been paid to the regular thursday evening anti-Israel picket outside Marks and Spencer on Oxford Street whose objective is to stop people shopping there on the basis that M&S was a chief funder of Israel’s creation and growth; proof if it ever was needed that Israel-hate is not premised on concern for international law but on Israel’s existence per se. It is also interesting to note how many of the Ahava protesters are loathe to be filmed, constantly covering their faces. One must also question if they are solely concerned about human rights why they don’t picket Iranian, Egyptian, Russian, Chinese and Sudanese businesses. If Ahava does close even the protesters will be disappointed as they will be forced to find another Israeli outlet to vent their anger against. 1. The EDO case, where a judge somehow found it within himself, during his summing up to the jury, to show admiration for those who had smashed up a British arms-making factory. 2. Phil Woolas losing his Parliamentary seat after his Lib Dem opponent ran crying to the courts accusing Woolas of lying about him, when lying on political leaflets is, sadly, a part of British election culture. There was also MPAC’s sinister intervention against Woolas. 3. Mick Davies, head of UJIA, using “Apartheid” in relation to Israel. 4. The Law Society allowing itself to be taken over for a weekend Israel hatefest in the form of the Russell Tribunal on Palestine. 5. Hearing “Spurs are on their way to Auschwitz” at Elland Road. Thank you to those that have given their encouragement over the last year (including Oyvagoy, Jeremy Havardi, MelchettMike, CIFWatch, ModernityBlog, Harry’s Place, ElderofZiyon, The London Jewish News, The Jewish Chronicle and The Jerusalem Post) and many other individuals, including some incredible commenters from whom I have learnt more than I could imagine. It has also been a year in which England retained the Ashes but lost a World Cup. Finishing on a high note Israel has just struck gas; £61 billion worth of the stuff, which sent the Tel Aviv stock exchange to an all time high. This should give Israel energy independence for 90 years and could allow for exports to Europe. As James Hider of The Times comments the old joke about Moses leading the Jewish people to the one place in the Middle East that does not have oil is not so funny anymore. There are two flotillas of ships sailing today and the contrast could not be more different. 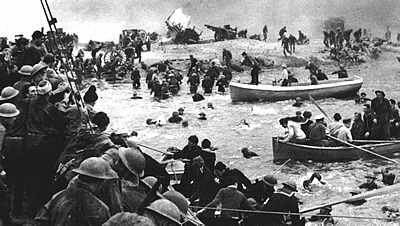 Today is the 70th anniversary of the evacuation of Dunkirk that gave us the term the “Dunkirk spirit”. It was a crucial moment in World War Two. Between 27 May and 4 June 1940 338,000 British and French soldiers were rescued from the beaches of northern France having been pushed back by the invading Germans. 700 vessels ranging from pleasure craft to fishing boats worked under a hail of German bombs to take the Allied troops off the beaches and ferry them to larger ships so they could be brought home. Winston Churchill called it a “miracle of deliverance” and the evacuation is seen as one of several events in 1940 that determined the outcome of the war. To mark the anniversary a flotilla of 60 small ships set sail from southern England and will return on 31 May. 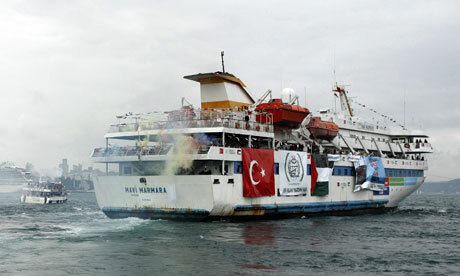 Then there is another flotilla supported by Viva Palestina and a Turkish charity. This one has just set sail to try to break the so-called “siege of Gaza”. Israel and Egypt have imposed restrictions on Gaza to stop Hamas, the Islamist resistance movement, firing thousands of Kassam rockets into Israel. Any such comparison of Gaza to the Holocaust, in which six million Jews and four million gays, communists, gypsies and disabled people were systematically murdered, is purely sickening. The people of Gaza should blame Hamas for their suffering, not Israel. But then we know what happens if they so much as protest against Hamas. Hamas is notorious for binding the hands and legs of so-called “traitors” before throwing them off the tops of buildings to certain death. Either that or the “traitors” are shot in both knees. When Viva Palestina conducted a convoy to Gaza in February/March 2009 George Galloway, according to the Charity Commission, confirmed that £25,000 of personal money was handed to Hamas along with 100 vehicles. I hope the current flotilla will at least bring something constructive to the area but when Viva Palestina tried to enter Gaza from Egypt in January an Egyptian border guard was shot dead by a Palestinian sniper. While Israel does in fact let in necessities and aid to Gaza it is Islamic extremists who are making life in Gaza intolerable, even to the extent of destroying a United Nations summer camp for children. They accused the UN of promoting immorality. The current convoy is trying to enter Gaza via sea instead of land after the extended trip Viva Palestina was sent on by the Egyptian authorities in January. So we recall today the brave men and women of the Dunkirk evacuation for their bravery 70 years ago while under heavy bombardment from the Nazis. There will never be enough gratitude that we can show them for what they did. The same may not be said for the activists on the convoy currently en route to Gaza*. * The father of kidnapped Israeli soldier Gilad Shalit asked the current convoy to carry a parcel and letter into the Gaza Strip for his son, who has been kept in isolation by Hamas for coming up to four years now. The activists refused.